The recent decision to discontinue the Rs 500 and Rs 1000 notes and introduce the Rs 2000 noteswas taken with a view to curbing financing of terrorism through the proceeds of Fake Indian Currency Notes (FICN) and use of such funds for subversive activities such as espionage, smuggling of arms, drugs and other contrabands into India, and for eliminating Black Money which casts a long shadow of parallel economy on our real economy. However, are our new currency notes printed with the involvement of the same blacklisted companies that infact were the source of fake notes to Pakistan in the first place? Sometime during 2009-10 CBI raided some 70-odd branches of various banks on the India-Nepal border from where counterfeit currency racket was unearthed. The officials of these branches told CBI that they had got these notes from RBI which led CBI to raid the vaults of RBI. What CBI found in the vaults of RBI were huge cache of counterfeit Indian currency lying in the denomination of 500 and 1000, the same counterfeit currency smuggled by the Pakistani intelligence agency ISI into India. The question was how did these fake currency landed in the vaults of RBI? Later in 2010 the Committee on Public Undertakings (COPU), an Indian Parliamentary committee was shocked to find out that the Government had outsourced the printing of Rs 1 lakh crore of currency notes to US, UK and Germany putting the “entire economic sovereignty (of the country) at stake”. The 3 companies to whom the Indian currency printing was outsourced are American Banknote Company (USA), Thomas De La Rue (UK) and Giesecke and Devrient Consortium (Germany). Following the scandal the Reserve Bank sent a senior official on a fact-finding mission to De La Rue‘s printing plant in Hampshire, UK. RBI which imports 95% of its security paper requirements and which is believed to account for up to a third of De la Rue’s profits excluded De la Rue from new contracts. De La Rue was blacklisted by the government with 2000 metric tonnes of its paper lying unused at printing presses and godowns. It was a disaster and De la Rue’s CEO James Hussey who is the godson of the Queen of England herself quit the company mysteriously. De la Rue’s shares tanked and it almost went bankrupt losing one of its most valuable customer – RBI. Its French rival Oberthur approached De la Rue with a bid to takeover the company which was fought back. The complaints sent to the Central Vigilance Commission (CVC) by ‘unnamed officers of the Ministry of Finance’ mentioned other companies too. These include French firm Arjo Wiggins, Crane AB of USA and Louisenthal, Germany. However as recently as January 2015 the Home Ministry barred the German company, Louisenthal, from selling bank note paper to the RBI after it discovered that the firm was also selling raw notes to Pakistan. So who are these currency printers and how did they end up printing currency notes for the Indian government? How did the company from getting blacklisted to a point of bankruptcy rose to its feet and is preparing to enter the Indian market again? Most importantly why is it that the common Indian know nothing about it? Here is a brief story of these Money Makers. The high-security currency printing and technology business is dominated by a few Western-European companies. In his book Money Makers – The Secret World Of Banknote Printing author Klaus Bender offers a detailed view of the banknote industry and its modus operandi by removing the industry’s carefully imposed shroud of secrecy. The only previous attempt to reveal this story was published in 1983 by an American author, Terry Bloom in his book “The Brotherhood of Money – The Secret World of Banknote Printers”. The entire edition of that book was bought up – straight from the printing presses – by two prominent representatives of the industry to prevent the public from getting an inside view of the business. The four major segments in the currency business are paper, printing presses, note accessories, inks and lastly integrators who provide total, end-to-end currency printing services. It is believed these businesses are tightly run by not more than a dozen companies operating out of Europe. These companies are believed to be operating since the 15th century. De la Rue’s history goes even further back to the company’s plant near Bath which has been a mill operating for 1,000 years. De la Rue was the official Crown Agent of the British Empire who still prints banknotes for the Bank of England. Crown Agents ran the day-today affairs of the Empire. In his book Managing the British Empire: The Crown Agents author David Sunderland explains how the Crown Agents printed the stamps and banknotes of the colonies; provided technical, engineering, and financial services; served as private bankers to the colonial monetary authorities, government officials, and heads of state; served as arms procurers, quartermasters, and paymasters for the colonial armies. In effect, Crown Agents administered the British Empire, which at one point in the 19th Century, encompassed over 300 colonies and nominally “independent countries” allied to the British Crown. Later the Crown Agents’ office was set up, under the supervision of the Secretary of State for the Colonies, in 1831 to consolidate the activities previously undertaken by a number of agents of varying efficiency and probity. This was done to properly manage the budding Industrial Revolution that destroyed the traditional Indian markets and economy. The first colony allowed to issue government notes was Mauritius, which in 1849 began to distribute rupee notes. No other colony was permitted to follow its lead until 1884. Colonies were required to obtain notes from the Agents, who passed orders onto the printing firm De la Rue. As per official history the bank note printing in India started in 1928 with the establishment of India Security Press at Nashik by Government of India. Until the commissioning of Nashik Press the Indian Currency Notes were printed from Thomas De La Rue Giori of United Kingdom. Even after Independence, for 50 years, Free India printed its rupees on machines bought from De La Rue Giori, run by the Swiss family Giori and till recently said to control 90 per cent of the banknote printing business. But than something happened at the closing of the 20th century that changed everything. On 24 December 1999 Indian Airlines Flight 814 also known as IC 814 was hijacked by gunmen shortly after it entered Indian airspace. Hijackers ordered the aircraft to be flown to several locations. After touching down in Amritsar, Lahore and Dubai, the hijackers finally forced the aircraft to land in Kandahar, Afghanistan, which at the time was controlled by the Taliban. For those of you who are not aware of the incident remember the Ajay Devgan starrer action thriller Zameen, which was based on this incident. What was not shown in the film however and what is not known to many still is that there was a mystery man on that flight. His name is Roberto Giori and he was the owner of De la Rue who controlled 90% of the world’s currency-printing business. The 50-year-old Giori, who holds dual Swiss and Italian nationality, is one of Switzerland’s richest men. Switzerland sent a special envoy to the airport to deal with the abduction of its currency king. It also put pressure on New Delhi to come to a solution that ensured their safe release. Two days after the hijack, on Sunday, 26 December, the Swiss Foreign Minister, Mr. Joseph Deiss, had a long telephone conversation with his Indian counterpart, Mr. Jaswant Singh, the Swiss press had reported. The Swiss Government set up a separate cell in the capital Berne to deal with the crisis and had sent special envoy, Mr. Hans Stalder, to Kandahar who regularly reported back to Berne. According to the Repubblica and Corriere Della Sera newspapers, ever since his return to Switzerland by a special plane, Mr. Roberto Giori has been under the protection of the Swiss Government. But there is a very important missing piece to this story. It is believed that a ransom was paid by the Indian Government for the safe release of Roberto Giori; this issue has been voiced not just from political sections but also from Intelligence. This issue is a hot potato for both the Congress and BJP and is likely to boil parliament in the near future. Whatever be the case the motive for the hijacking was reported to be to secure the release of terrorists held in Indian prisons. The hostage crisis lasted for seven days and ended after India agreed to release three militants – Mushtaq Ahmed Zargar, Ahmed Omar Saeed Sheikh and Maulana Masood Azhar. These militants have since been implicated in other terrorist actions including the Mumbai terror attacks. While the release of terrorists maybe one of the motive for hijacking the plane, there are bigger things at stake here than is usually understood. Roberto Giori was not an ordinary man not even an ordinary VVIP. He was the owner of the company that has been printing currency notes for more than 150 countries since centuries. And it has a dark history in each and every country that it operated in. We mention few instances here for our readers to understand the gravity of the situation and encourage you to study others. Colonel Muammar Gaddafi, the Libyan President was starved of currency before he was militarily overthrown. He was unable to pay his soldiers. The contract for printing the banknotes was given to De La Rue but they were not delivered until it was too late. With the destruction of the Berlin Wall and the break-up of Soviet Union, many newly independent countries sprang up overnight. One such country was Chechnya (formerly part of the Soviet Union) who signed a secret deal to print passports and banknotes with De la Rue. Two brothers Ruslan and Nazerbeg Utsiev were sent to conclude the deal. Apart from printing passports and banknotes they were also trying to secure 2000 ground-to-air Stinger missiles from Britain, Russia’s age old arch-enemy. The KGB was tipped-off and soon two Armenian hitmen were on their way from Los Angeles to kill both the brothers and the deals. Both the brother were found dead soon after. The brothers and the deals were dead but De la Rue survived. All was well until in 2010 the Parliament Committee was rocked with the scandal and De la Rue with other companies were blacklisted from operating in India and almost went bankrupt. This brings us to the recent demonetization move. Is De la Rue involved in the printing of the new Rs 2000 notes? [The notes]were largely printed at Mysuru under utmost secrecy while the paper note on which the printing was done came from Italy, Germany and London. The printing, according to officials, began in August-September and nearly 480 million notes of Rs 2,000 denomination and an equal number of Rs 500 denomination were printed. The printing facility at Bharatiya Reserve Bank Note Mudran Private Ltd. (BRBNMPL) in Mysuru under Reserve Bank of India was set up with the De La Rue Giori, now KBA Giori, Switzerland. India imports bank note papers from European companies like Louisenthal in Germany, De la Rue in United Kingdom, Crane in Sweden and Arjo Wiggins in France and Netherlands. India had blacklisted two European firms in 2014 amid reports by security agencies that the security features, which come embossed on bank note paper, were compromised and given away to Pakistan. But the ban was lifted and the companies were removed from the blacklist. Why? Here is the reason given for the lifting of the ban. “These companies are in the business for 150 years; they will not hamper their trade by passing on information of one country to another. Some of these firms even print currency notes for smaller countries. After the investigations, it was found that the two firms had not compromised the security features and the ban was lifted,” said the official. However the Serious Fraud Office (SFO) of UK itself in their inquiry had uncovered that a number of De la Rue employees had deliberately falsified certain paper specification test certificates for some of its 150 clients. 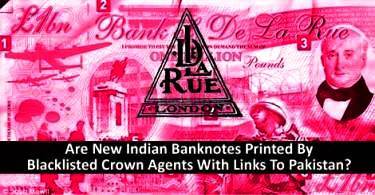 Recently it was also revealed in the Panama Papers that De la Rue paid out a 15% commission to a New Delhi businessmen to secure contracts from Reserve Bank of India. There are also reports that De la Rue paid £40m in settlement to the RBI for issues in production of paper notes. Even so after all this it has been given clearance and there are even plans in discussion with De la Rue for setting up of a security paper mill and a research and development centre of identity software in Madhya Pradesh. Martin Sutherland the new CEO of De la Rue in an interview titled Giving Make in India the Currency to Succeed with India Investment Journal said that under the UK-India Defence & International Security Partnership Agreement which was signed in November 2015, De La Rue is committed to supporting both governments on the subject of counterfeiting under this agreement. However there has been no official announcement made regarding the lifting of the ban on De la Rue and its removal from the blacklist apart from the news report. De la Rue that almost went bankrupt after losing RBI contracts reported a whopping 33.33% rise in its shares in the last six months. The question that still need to be answered is; are the new Indian currency notes printed with the involvement of blacklisted Crown Agent companies who supplied and were the source of fake notes for Pakistan at the expense of India’s National Security?